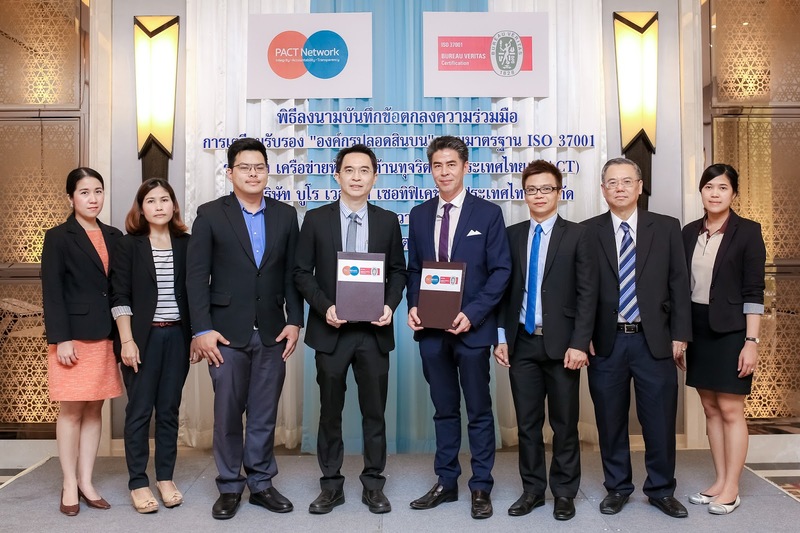 Bangkok，23 December 2015 - Partnership Against Corruption for Thailand, or PACT, and Bureau Veritas Certification, or BVC, held the signing ceremony for cooperation on the development of implementation guidance and certification scheme on anti-bribery management systems, in notion of “bribery-free organization” according to ISO 37001 – anti-bribery management systems standard which expected to be finalized by end of 2016. The cooperation on the development of implementation guidance and certification scheme on anti-bribery management systems according to ISO 37001 is initiated by PACT, the network of partnership against corruption formulated by Thaipat Institute providing platform for private sector to support anti-corruption in practice, and BVC, a global leader in conformity assessment and certification services. The scope of the cooperation focuses in developing guidance to help an organization implement an anti-bribery management system and a set of assessment criteria in relation to their implementation against the requirements set out in the ISO 37001 standard. The initiative will engage 5-10 pioneer organizations to implement a series of anti-bribery measures in a proportionate and reasonable manner, and assure their implementation ready for certifying by an independent body according to international standard for the first time in Thailand. Dr.Pipat Yodprudtikan, the director of Thaipat Institute as the organizational founder of PACT, addressed about bribery and corruption in organizations that it is still a most problematic factor for doing business in Thailand. According to PwC’s 2014 Global Economic Crime Survey, bribery and corruption is significantly higher in Thailand (39%) compared to Asia Pacific (30%) and globally (27%). The survey also found out that Thai respondents tend to respond to fraud detection similarly to others worldwide. Eighty percent of all respondents respond with internal actions. But being in line with the global response does not necessarily suggest that this is the best practice. Using internal resources is preferred because it is potentially cheaper. However, internal resources may not be enough to resolve cases. The report suggested organizations to engage an independent investigator due to their professional expertise, experience and skills. Prawaltong Tongyai Na Ayudhaya, Certification Manager of Bureau Veritas Certification (Thailand), Ltd. said that the anti-bribery issue has been raised in the international forum and convention such as OECD Anti-Bribery Convention. Thailand has enacted the Organic Act on Counter Corruption; however, only legislative measures might not be sufficient. Preventive measures on anti-bribery should be equipped as part of the organizational management systems, as well as quality and environmental management systems. ISO 37001 - anti-bribery management systems helps provide assurance to the management and owners of an organization, and to its shareholders, customers and other stakeholders, that the organization has implemented internationally recognized good practice anti-bribery controls. Organizations could impose this standard as a criteria for conducting business or due diligence on projects and business associates. ISO 37001 - anti-bribery management systems is a requirements standard, and provides guidance for establishing, implementi ng, maintaining and improving an anti –bribery management system. The system can be independent of, or integrated into, an overall management system. The standard is capable of independent certification from the certification body. It helps the organization prevent, detect and address bribery risks in relation to the organization’s activities in the public, private and not-for-profit sectors, by (of) the organization or by (of) its personnel or business associates acting on its behalf or for its benefit, direct and indirect bribery (e.g. a bribe paid or received through or by a third party).